Haredi city in Negev – blessing or curse? A recent decision by the Ministry of Interior's Southern District Planning and Construction Committee, to go ahead with the construction of an ultra-Orthodox city in the Negev, has sparked a controversy among the area's residents. According to a government plan green-lighted two years ago, a new city – Kasif – is to be built as a housing solution for the haredi community, near the southern junction of highways 80 and 31. Meant to cater to haredi residents exclusively, Kasif is slated to stretch across 990 acres and house close to 50,000 people, with initial assessment by the Interior Ministry saying the number of residents may very well double. Arad Mayor Gideon Bar-Lev, however, seems less than enthused: "All of the Negev's development plan recommend attracting strong sectors and minimize the construction of new towns. Building Kasif goes against all of these recommendations." The new town, he added, will also hinder the plans to turn Arad into a "green city," by building an electricity-generating windmills "farm" on the city's outskirts. "This is about producing clean energy, which is a national interest. It will not be possible once a community is set up in that area." Dimona Mayor Meir Cohen, on the other hand, welcomed the initiative: "I welcome any plan to create a Jewish community in the Negev. We are not oblivious to the demographic issue. "I'm sorry to see that in an age when we are clamoring for people to come and live here, there are those who treat the haredim as of they were alien corn, and I'm amazed that anyone would think Kasif would be a city for the indigent. The Negev is worthy of haredi inhabitants, just as it is of people from Tel Aviv." Avi Heler of the Interior Ministry also welcomed the plan, saying it would allow for both bolstering the Jewish population in the Negev, as well as for the reconstruction of Highway 31, connecting the Shoket Junction with Arad. Dr. Sarit Oked, an environmental activist, begs to differ: "The city of Arad was designed to house 50,000 people, but in reality it houses only half that number. It is best to expand Arad, rather then build another town next to it. "Arad is known for its social and cultural mosaic and the harmony in which its diverse communities of secular and religious people, veterans and immigrants, the young and the young at heart, all live in. I see no reason to build a haredi ghetto nearby," she said. The strongest opposition to the plan is from the Israel Nature and National Parks Service (NNPS) and the Society for Protection of Nature in Israel. The latter recently published a report listing 81 threats to Israel's environment, wildlife and plant life, mentioning Kasif as one of the dangers. The NNPS says that there are other alternatives for a haredi town in the south, suggesting that the planned southern communities of Hiran and Carmit – both of which are to be adjacent to Shoket Junction – are suitable for that purpose. 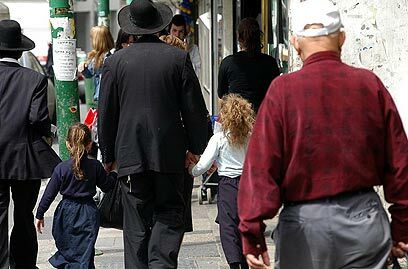 The NNPS also argues that haredi residents should be encouraged to inhabit all of the south's cities, making for better integration in society. See all talkbacks "Haredi city in Negev – blessing or curse?"